This lesson presents the important and extensive roles of women in social justice movements. In this 45- to 90-minute lesson, participants take on the identity of one activist and interview at least six more. This lesson has been used successfully in middle and high school classes and in teacher workshops. One of the least recognized stories of the Civil Rights Movement is the role of women. This is true despite the fact that women were responsible for many of the achievements of the Movement. They developed strategies, marched in demonstrations, attended mass meetings, registered voters, taught in freedom schools, wrote searing critiques of societal structures, organized boycotts, and risked their lives. What’s more, the participation of women crossed racial and ethnic lines. Unfortunately, in the more traditional narrative of history, women’s work in the Civil Rights Movement is reduced to one or two iconic women at best. 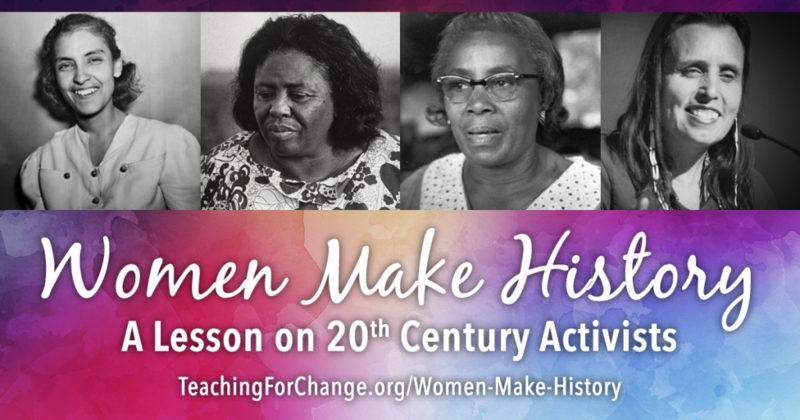 Teachers may use this activity to introduce students to the many women involved in the Civil Rights Movement and other movements for social justice — women whose lives and legacies transformed understandings of leadership and democracy. This activity is useful as preparation for a larger study of women in the movement or of the Civil Rights Movement in general. 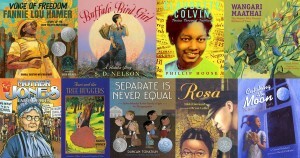 The lesson makes participants aware of how many more women were and are active in movements for social change than we typically see represented in textbooks, children’s books, and the media. However, the lesson provides only a brief introduction to the lives of these women. We recommend the related resources at the end of the lesson for students to deepen their understanding. If you use the Women Make History lesson, we would love to receive your feedback, suggested edits, and photographs. Send us an email.